Also, Samsung might have created the best wall-mount system yet. Here's the truth about most premium non-OLED 4K TVs today: They all look pretty good. But it's the small differences among them that make it tough to choose a new 4K set. As we move into 2017, prepare for those differences to get even more subtle. Case in point: Samsung just announced its new QLED 4K lineup at CES, which offers brightness, color and other improvements over last year's high-end SUHD lineup. Basically, it's yet another attempt to get LED TVs' picture quality on par with what you'd expect from an OLED set. At the heart of the QLED line -- which includes the Q9, Q8 and Q7 sets -- is a refined metal Quantum Dot material. That lets the TVs show off a wider range of color. Samsung says the QLED sets can display 99 percent of the DCI-P3 color space, and they can also show off full color volume no matter their brightness. Up until now, you'd typically lose color accuracy as you pumped up your TV's brightness. The QLED models also feature a peak luminance between 1,500 and 2,000 nits, whereas last year's SUHD models topped out at 1,000 nits. That means bright areas of the screen will pop even more, especially with HDR material. The new quantum dots also allow the sets to produce deeper black levels than before. Beyond the screen improvements, Samsung has also implemented some useful practical upgrades. All the QLED sets rely on a new Invisible Connection fiber optic cable, which connects to a breakout box for inputs. Together with some fairly thin power cables, you'd be able to hang them from your wall with little visual clutter. Speaking of hanging things on your wall, Samsung developed a "no-gap wall mount" for the QLED lineup, which lets you mount the TVs on your wall seamlessly. Instead of having the mount's hardware stick off the wall, Samsung embedded it inside the back of the TVs. The mount itself is a fairly thin mechanism (and yes, you'll still need to mount it properly on wall studs), and it can easily tilt the TVs in different angles. 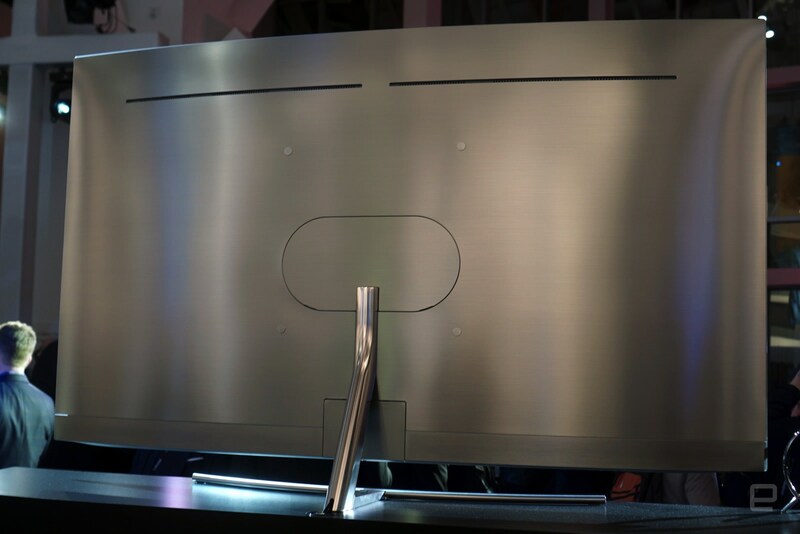 Samsung claims the new mount will let you hang up your TV on your own. You don't even need to worry about leveling, as it'll automatically adjust the TV to sit perfectly straight. It's always nice to see steady improvements in the 4K world, but honestly I'm more interested in the other ways Samsung is trying to make our home-entertainment lives easier. There are still plenty of problems to solve, after all.